Hi. Glad you stumbled upon my blog. I’m a national park ranger in Utah, but behind those outward trappings I’m a normal middle-aged midwestern woman who has chased down her dream and won’t let it go. I’m a passionate lover of this part of the West; in my blog I share moments of supreme beauty and exhilaration as well as frustrations and fears. I talk about everything from bad grammar on signs to flash floods to crazy tourist exploits. Basically, I take you along and let you see Canyonlands and Arches National Parks through a ranger’s eyes. If you’ve ever wondered what it’s like to wear the flat hat, read a few posts. I’m pleased to have you along! Curious to read my “About Me” paragraphs from my first years? Here they are. 2009: Name’s Kathryn. Got me a dream job. Got me a blog to blog it. Now I must learn the skills for both. I have taught high school science (and assorted other subjects) in small-town Minnesota. At least that was my last job. I’ve also been a nurse, a midwife, a massage therapist, a lactation consultant, and a home school teacher. You’re welcome to come with me! Great to have friends along for the ride! 2010 addendum: My bosses appear to have approved of me last summer and wanted me back. This year will be very exciting: spring in Arches N.P. as a Volunteer In the Parks (VIP), summer in Canyonlands N.P. as a bona fide park ranger. I’d be honored to have you follow along. The RSS feed button, or anything labeled “subscribe,” will provide you notification each time I post something new. You don’t have to read it all! 2011: I’ve secured a raptor monitor position at my beloved Arches National Park during the breeding season. Fall and winter have me working as park ranger in Canyonlands NP, a place of great solitude and tranquility. 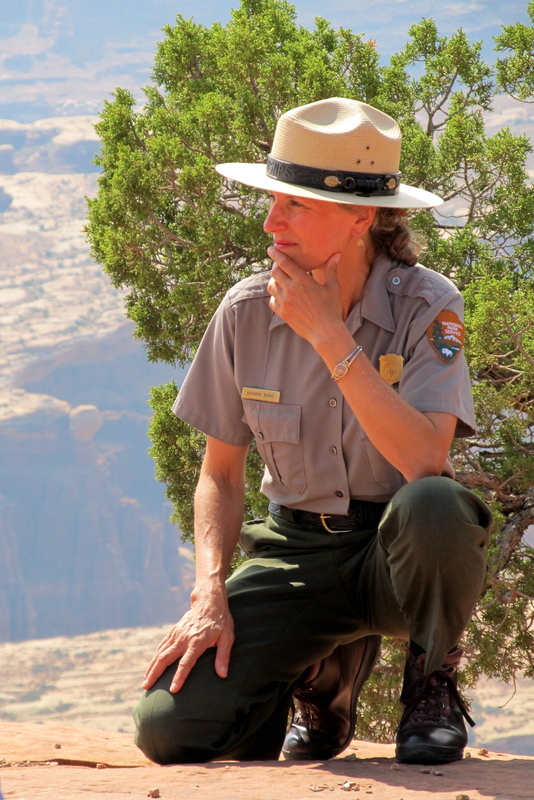 2012=13: Holding down the fort at Canyonlands NP! Congratulations Sis! I hope that you have a wonderful Summer! Enjoy the ranger life. You are perfect for that job! Way to go, Ranger Kathryn!! Aaah. Superlative praise to our Creator! Thank you for sharing, Kathryn! Looking forward to seeing the ride! I am drinking in the exquisite photos of yet-untraveled land to my eyes through your lenses. In gulps, as it has been three weeks since I last got on your blogspot. Congratulations on your being selected for the Rescue course 🙂 and learning all the knots you need to do. I know you can do it. A great new focus and challenge! Mouse, scorpion, dent in Olive, family visit all makes for quite an adventure, too. Happy Spring in the Arches! Wonder over which hill in the journey ahead you will appreciate all you are learning today. Dear Kathy: I am writing to ask your permission to use the photograph titled (D) Lone pictograph high on wall….. in my honors thesis at the University of Arkansas, the subject of which is a synthesis of rock art, ceramics design, and archaeoastronomy in the southwest. Debre: Although we’ve already communicated about this in private, here is another record that I have given you permission to use my photo. Two days ago I scoured Hellroaring Canyon for the “Comet Panel” — a bright yellow comet painted next to a large anthropomorph. Unable to find it but will go back once I find a local who has been there. Archaeoastronomy surrounds us! It makes me wonder what celestial event precipitated that rock art? Had to be a very memorable and amazing one. DE CASUALIDAD O NO, DI CON ESTE BLOG. TRATANDO SIEMPRE DE BUSCAR DE ALGUNA MANERA, RESPUESTAS Y COINCIDENCIAS, DISPERSAS POR EL PLANETA, SOBRE SUS ANTIGUOS POBLADORES. ES INCREÍBLE COMO ESOS LUGARES ELIGEN SUS ÁNGELES PROTECTORES… ESE ES EL LUGAR QUE TE SEÑALO. DESDE NONO, CÓRDOBA ARGENTINA( BIEN LEJITOS Y DESDE MI LUGAR)… MI REVERENCIA. I work for ForestryDegree.net, a website that offers news and general information about forestry and forest management. We strive to make our website a useful resource for anyone interested in forestry or conservation, especially those pursuing education and careers in the industry. To that end, we are doing research and evaluating resources from across the web to build a list that recognizes 100 of the top forestry blogs and websites. We are pleased to tell you that we have nominated Ranger Kathryn’s Arches for inclusion on our list! If your site is featured on the final list, we’ll create a badge you can use to promote your inclusion through your site and social media accounts. Once the list is published, we’ll be reaching out to other forestry blogs and websites to make sure your site gets proper recognition as a useful resource. Additionally, if you wish to nominate another forestry or forest management website that you feel is worthy of a spot on our list, please let us know. Thank you, Amy. It is very validating to have one’s work appreciated, and if it can help anyone else, my blog will have served its purpose well. Just came across Abbey’s “Desert Solitaire”. Thought I’d google some images and up came your blog. Coincidence? I hope you’re still out having adventures. I stumbled upon your wonderful blog this past winter and really wanted to leave you a note because of where I am now: serving in the best internship I’ve ever had in my all-time favorite national park (GRSM). I found your blog while hunting for summer jobs in the Smokies, and your posts gave me that extra boost of inspiration and determination I needed to land one. Thank you for sharing your adventures with us, and thank you for the work you do as a ranger–I’ve quickly learned this summer that park rangers are the greatest people you could ever meet. 🙂 I hope to be lucky enough to be one myself now after college. Wishing you many more wonderful adventures in your park(s)! Thank you for your blog, which I am reading in “catch-up” mode, having discovered it only recently. Your words take me back to many places I have seen that, paraphrasing Ed Abbey, made me, a grown man, weep. I am heading “out to the canyons”, that’s where I tell people I am going, in about a week, on Labour Day, for seven weeks. It is my eighth trip, and the fifth one where I will be camping. I call southern Utah, and the parts of New Mexico, Nevada, and eastern California I love, “God’s Sandbox”. Thanks again, and like many others, I envy you!